Hi everyone and thanks for stopping by. 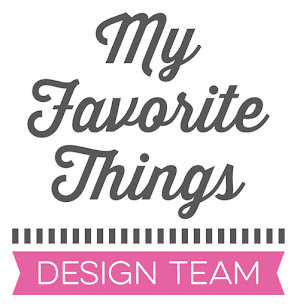 Today, the MFT design team is celebrating Flopsey's Greatest Hits! 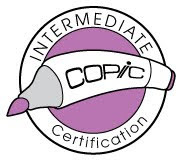 Be sure to stop by Kim's blog for a full list of participants (11 AM EST). There is a special promotion tied in to today's group post. Use the code FLOPSEY for $3.00 off any Flopsey set! This code will be valid Thursday June 10 and Friday June 11th. I chose Flopsey's Flowers. This is one of my all-time favorite Flopsey sets. 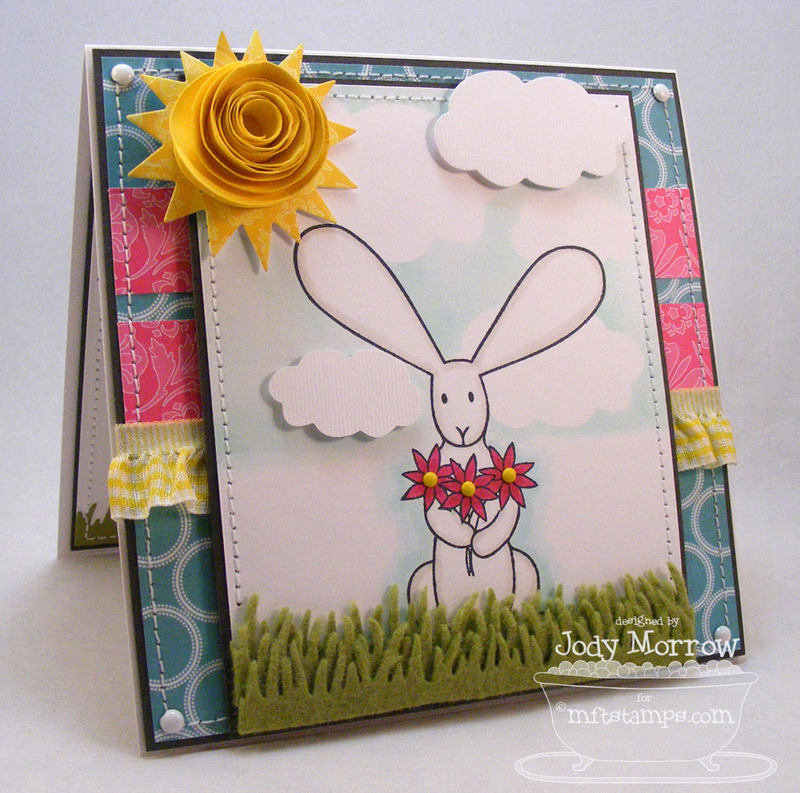 I had so much fun incorporating the Die-namics dies into this card! Look at my white cloud. Doesn't it look like I cut it out of white grosgrain ribbon? I didn't! 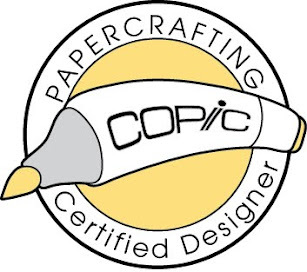 It's paper! EEEEEEK! I used MFT's new Ribbon RE:Creations Grosgrain Texture Board after I die cut the cloud out of white card stock. Isn't that SO neat? It looks and feels like ribbon. To create depth in my scene, I added clouds in varying heights. For the background, I die-cut some clouds out of Eclipse masking paper and then stuck them down on my card panel and airbrushed a blue background using my Copic markers. 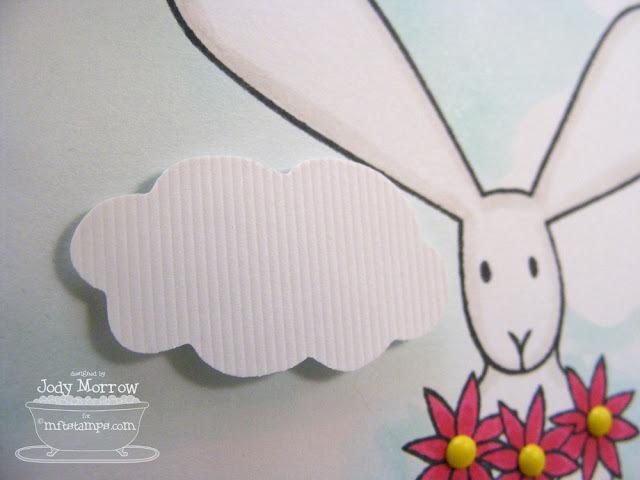 Then, I cut out clouds using white card stock, embossing them using the Grosgrain Texture Board, and then popped them up. I also added a sun, using the new Sunshine die and then added a rolled flower to the center of it. 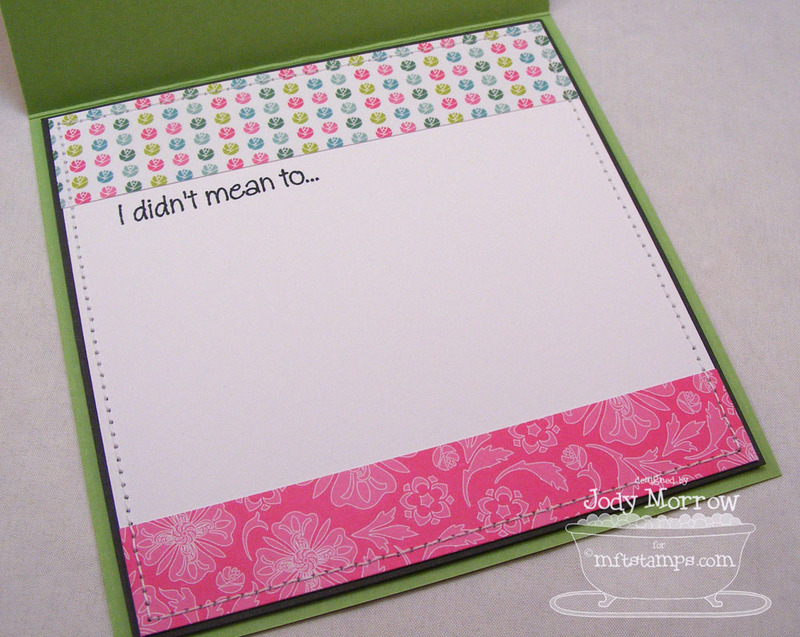 I was inspired by Julie's card HERE. Here is a peek inside. I again used the Sunshine, Fresh Cut Grass and Cloud Die-namics dies. 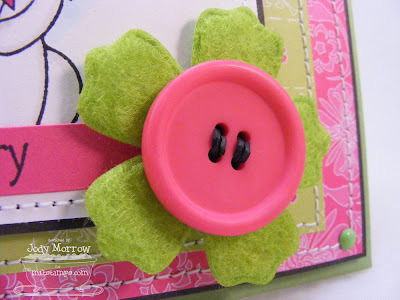 My super-sweet friend, Michele, recently made THIS card using a fun felt flower. I LOVED it so much that I became obsessed with finding some of my own. She's a trend-setter like that. I can't tell you HOW much money she has caused me to spend. LOL Thanks, Michele. :) I added a fun pink button and some black floss to the center of the flower to tie it in with my color combo. Here is a peek at my pink ribbon. JUST KIDDING it's PAPER! Isn't that so cool? 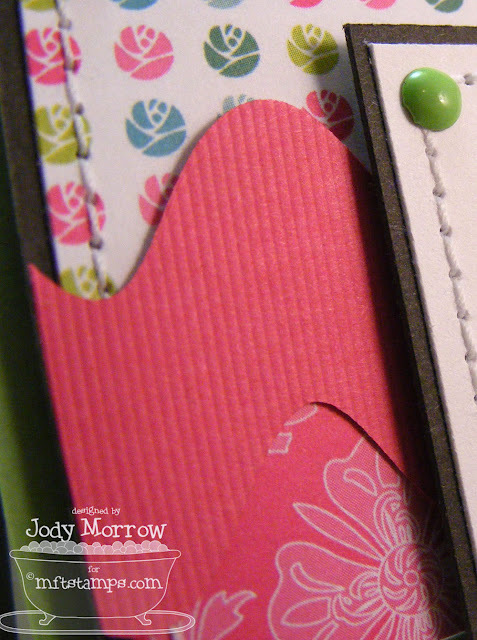 I used the new Jumbo Ric Rac Die-namics die and the Ribbon RE:Creations Grosgrain Texture Board to create it. Thanks for stopping by! Sorry this is so wordy. LOL I was just SO excited about using all my new toys! Oh my! Both are FANTASTIC! Love how you made the sky background! Awesome! Just so you know...YOU have enabled me just as much to spend...haha! Not that I'm complaining! I love it when you create and I think....hey I need to try that! Thanks for always inspiring me! Love them both but especially the first!! Your sun and clouds are freaking amazing! 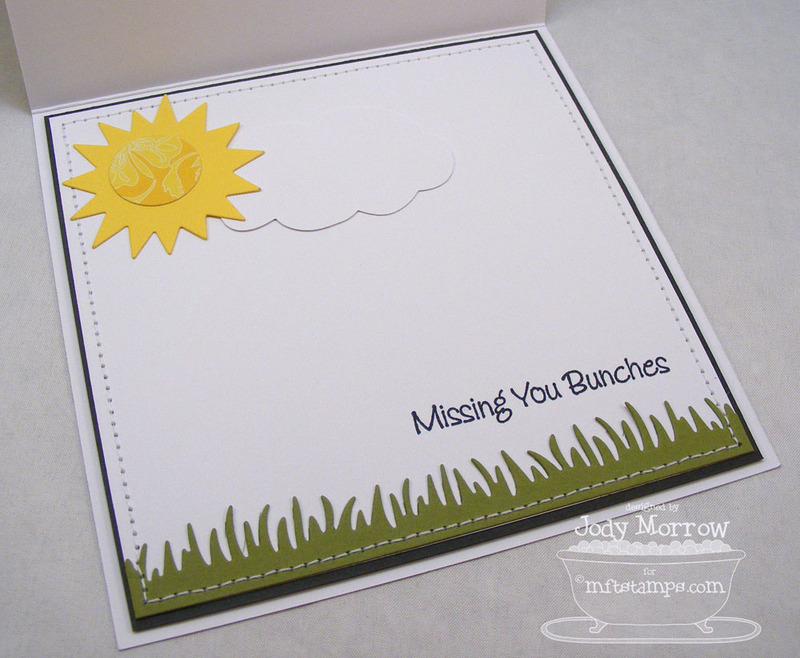 And the sky and grass .... swoon! Those brads are perfect in the middle of the flowers! ACK! FABULOUS cards, Jody! LOVE all your details--the airbrushed sky, that sun-flower, the grass, everything! That sun is the cutest idea!!! Great cards! OOOOOH! That sun! AAAAAAAH! The clouds! 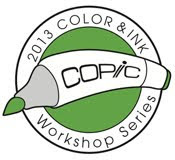 Your coloring, the layouts...PERFECTION!!! Awesome Jody!! Love how you used all the new goodies. Jody, this is ADORABLE! 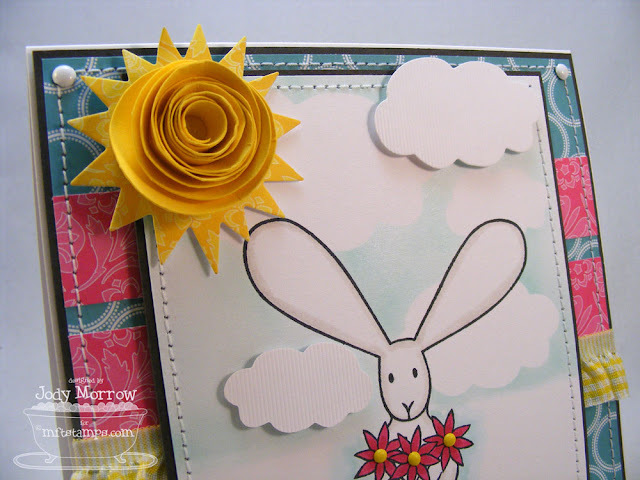 I love the bunny, love the felt grass, love the sun flower...all of it is just awesome. Great card! ooooo,Jody! sooo cute and very fun-thanks for playing with your new toys and sharing them with us! LOVE your sun!!!! 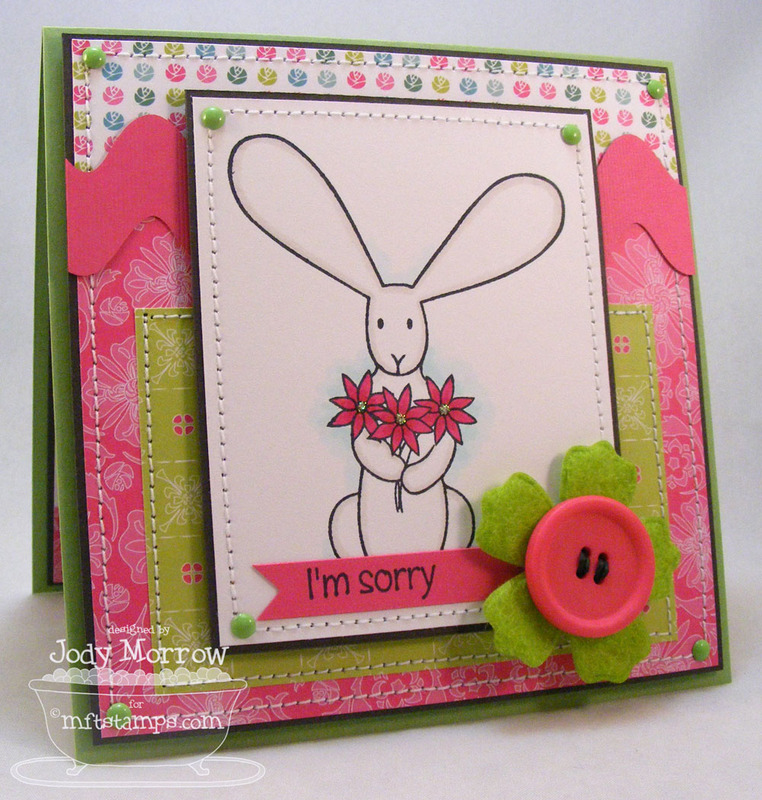 Awesome cards, Jody! Love the flower on the sun and the grass! Way to go on the clouds, too! Fabulous cards Jody! The grass is fabulous and I love all the bright warm colors! I can't wait to try making a sun like yours. Very cute!